Made it for a good friend of mine who is a kitty. I started by finding a nice picture of a wildcat and blowing it up using the old trick of making a grid on the picture and a larger grid on a blank piece of paper, and copying the lines in each square. 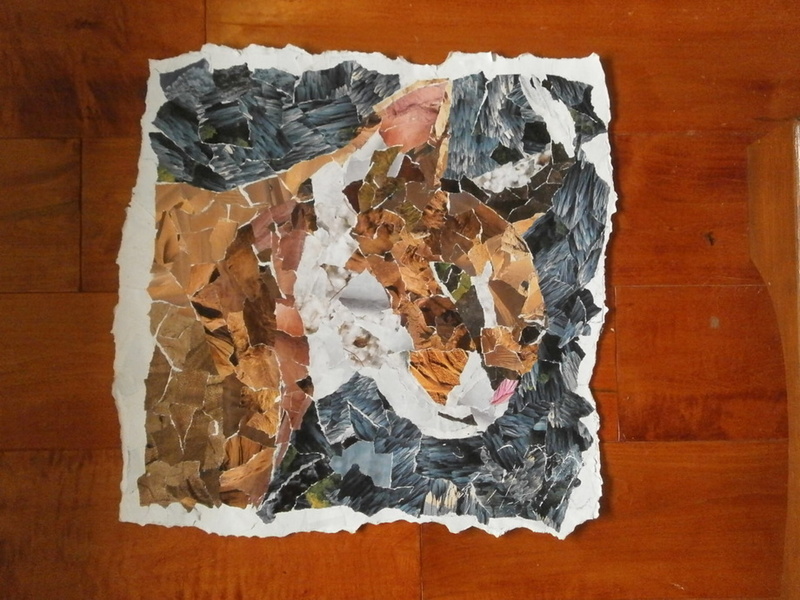 then I ripped up pieces of a couple of issues of national geographic and glued them over top to create a collage which when seen from afar vaguely resembles a cat like creature. I did it over the course of three or four days. The blue background is composed of the razor sharp limestone spikes of Madagascar's Tsingy nature reserve. It gives you vertigo if you look to close. And the sandy tones are composed of desert sands and mummified egyptian cats! I plan to do more once I get my hands on some more colorful magazines.